:Set in her beloved city of Cambridge where she enjoyed a very happy childhood, this novel from Anne Atkins follows the life of autistic junior fellow, Theo, and a first year undergraduate, Charlotte. Their growing friendship becomes tested when a threat to their beloved city comes to light. Along the way, we meet their respective families and friends, such as Suki, who fights a battle in court against a senior researcher; Hui, whose family in China turn out to have a vital role to play in the foiling of the bomb plot, as well as in Theo's belief in cryptocurrency; and Peter, who is attempting to keep Cambridge's Christmas Eve tradition going in his new role for the university. We also have the antagonist: Harry, who comes from Theo's past and threatens both his present and his future with his goal of changing the cityscape and the lives of Cambridge and its inhabitants. 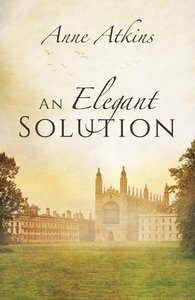 An Elegant Solution has threats to life and pursuit of a mystery that link it to a thriller, but equally it feels at times like a romantic comedy with the relationship that blooms between Theo and Charlie, as well as the obstacles that lay in its path. Furthermore, it covers sensitive issues such as autism and sexual assault, and more intellectual topics with maths, theorems, and bitcoin.